Looking back over the last few years, I never seem to get much posted in November. November is always busy and I always get behind. So let me catch you up on what has been going on. Movie Night was actually October 30th but we will include it anyway. Movie Night is always fun and this one was perfect and went off without a hitch. Not only did I get to be a Greeter but this year we had another Greeter – another Grandma! 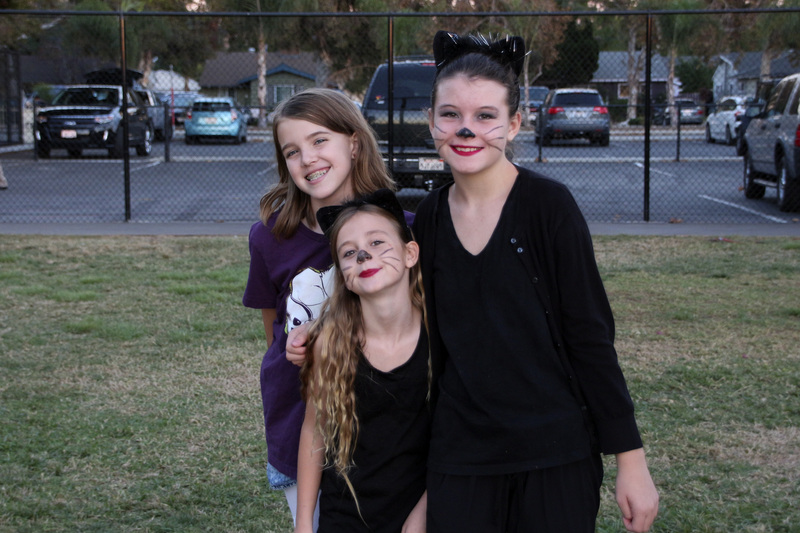 The PTA screened The Nightmare Before Christmas and students were allowed to wear costumes – just no masks and no weapons! They’ve never been able to wear costumes to school so this was extra special. The weather was perfect, too! One of the highlights of Movie Night was when a 1st grader came up to me with their Mom and said “Hi Grandma Kc”. His Mom asked me if I was one of the teachers. I explained that I am the Box Tops Chairman and his class had won the October Box Tops contest. We had treated them to a mini-cinis and milk and juice breakfast! Jenna always introduces me to the classes as Grandma Kc and the little ones especially love calling me that! I was beaming! 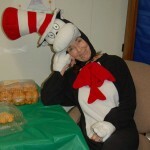 Once Halloween was over, I was able to reserve my Cat in the Hat costume for Read Across America in March. I can’t wait to be the Cat again! One of those feel good moments was when one of the PTA Mom’s told me that her son asked if the Cat in the Hat was coming back again. She asked him if he liked it and he told her “it was the best day of the year!” I am so glad the PTA is having me do this again. I had tried to reserve the costume in October. The costume shop was crazy getting ready for Halloween so this was one of the things on my To Do list for the second week of November. November was also the month that Amara attended her first school dance! Keep in mind our little girl is in the 6th grade! The dance was from 2:30-4:30 on a Friday afternoon in the Media Center. I had seen some of the photos they had posted of the students decorating it the day before. 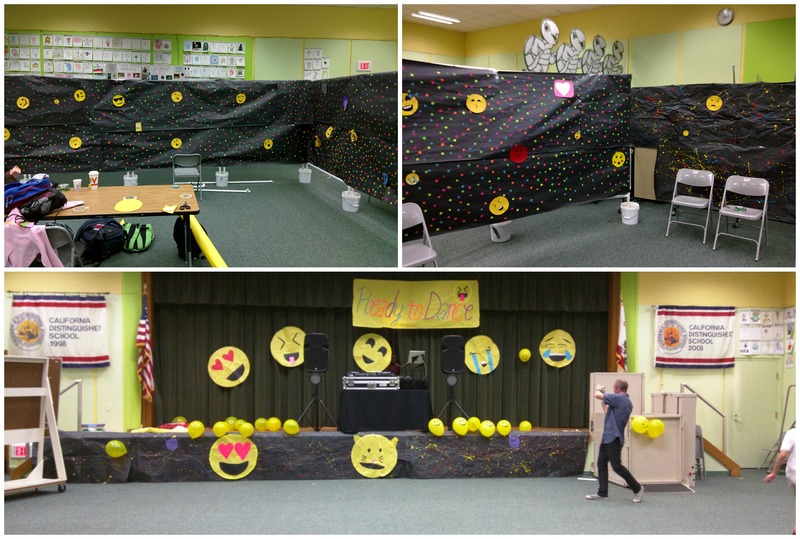 The theme was Emojis and the Media Center looked wonderful. I didn’t go but Jenna was a chaperon and she and Amara called me on speakerphone the minute the dance was over. “It was awesome, Grandma!” They loved the DJ and Amara and her friends had a wonderful time! 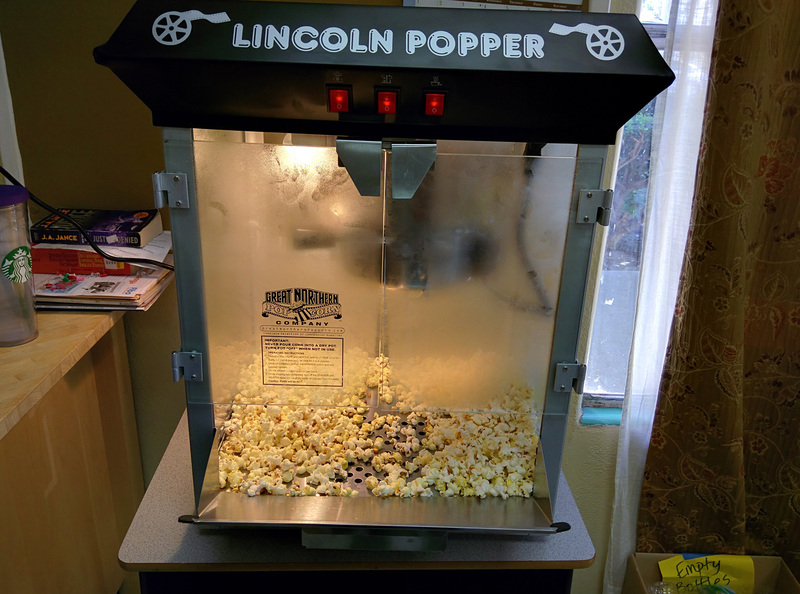 While we have been having typical awesome California weather and our fruit pop sales have been great, the weather is starting to get cooler so the PTA invested in a popcorn machine! We spent a few hours at school one day setting up the new machine and trying it out! Just happened to coincide with the teachers lunch schedule and since we were using their break room to test the popper we let them sample it for us! I can’t wait until our first sales on campus! 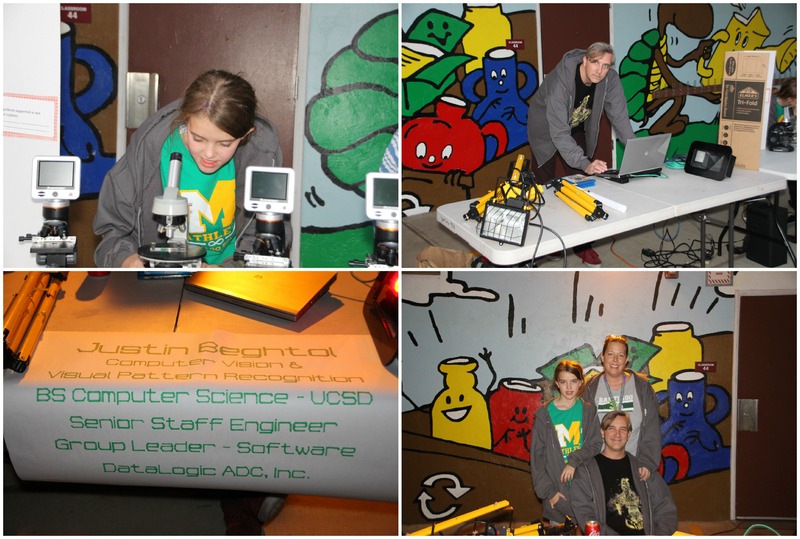 I also got to help out at Science Night! I can’t tell you how cool this was! One of the science teachers spearheaded the event – something else that had never been done before and was a huge success. Parents and students were both invited and the turnout was huge! There were tables set up with science experiments and demonstrations. Of course, the best one was Justin’s table! Amara’s Daddy is an engineer with the robotics company that makes Lane Hawk. You might have seen it at your grocery store. It scans the underside of your shopping cart so that items aren’t missed. He did a great demonstration of the software and how it works. The kids (and teachers!) loved it. They had also recruited local scientists and had them in classrooms where students could individually “Ask a Scientist”. The kids loved this and the lines were long! At the other end of the campus, they had classrooms set up with hands on experiments like building bridges and making slime. The PTA had brought in food trucks and again we got lucky with perfect weather. It was a great evening. The next day was Italian Street Art. The PTA sponsors this event for 6th, 7th and 8th graders. I have gone the last 2 years to help and to take pictures. This year was the best because Amara is now in the 6th grade and so she and all of her classmates were involved. It was a little bit warm but the students truly enjoyed themselves. The last morning of school before the Thanksgiving break, the PTA organized a breakfast for the teachers and staff. Of all the things that have been going on that was the only one that didn’t get me extra hugs from Amara. I didn’t see her that day but I did get extra time with her Mommy and that made it a great day. I said this last year but it bears repeating, I am so glad that we live close to The Kids and Amara and that I have the opportunity to be part of all of this! This memory was posted in Volunteering and tagged Italian street art, Movie Night, PTA, school, Science Night, volunteer on November 28, 2015 by Grandma Kc. I just LOVE reading these and am so impressed at the amount of quality experiences this school provides for the students. Fun, family and education are all wrapped up together! Wonderful! I love seeing the contributions that grandmas make. I think you are an excellent role model for those volunteers. It really is such a great combination of things. Her school has such great teachers who go over and above just doing their jobs. And you have a lot of parents who want to help make the school an even better place. And it all works! I hope I am being a role model for other Grandmas out there and I can’t wait until you can do things like this at Bree’s school. You will take the place by storm with your crafting skills! Girl, I think you did take the time, cause you needed it. What a big time. I always believe that those extras will be the impetus for some child to pursue a career she/he wouldn’t have otherwise considered, or perhaps even known about. That is educating the whole child. You would have just loved this evening — the faces on the students and how engaged they were! They were enjoying Ask the Scientist so much that the teacher who was manning the door had to get a stop watch and start limiting the students to 10 minutes so that others got a turn. And next year will be even better! Who could have time for blogging when they are this busy with family activities with your daughter, granddaughter and son-in-law. It sounds like you had a magical month, friend. Amara is a lucky girl, and I hope the school appreciates how much you contribute to the school community. Life is good in CA. Life really is good and as I tell people at school, when Jenna was growing up I was working 70+ hours per week and I didn’t get to do any of these things. Now I get to do them FOR Amara WITH Jenna! Life is good! So many fun and educational activities going on and a popcorn machine for the cooler months is a fantastic idea…I’d be getting some every day! I really do have fun being the Cat! And I just love that I am having an impact on little ones! I never thought I could do that. Oh and about the popcorn machine, we have one teacher who is pregnant and having constant popcorn cravings. She is so happy! You are so blessed to be such an involved grandma–not to mention the blessing you are to Amara, her teachers, and school mates. I am a lucky Grandma! Not to stray from the topic but – “It was the best day of the year!” from a kid in grade school? You don’t get higher compliments much higher than that. Great post honey, and you’re obviously doing a great job not just with Amara but all the kids. It is great to feel like I am impacting so many little lives. We are lucky Grandparents! Yes, you have been busy! The little guy calling you Grandma KC- you will always be remembered in his childhood memories! You have a way of making children happy and comfortable. What a special person you are! Thanks Debra! I really am having as much as they are. Growing up I wanted to be a teacher (Kindergarten) or an actress. Neither happened but fun times like this sort of fulfills those dreams. I’m making lots of good memories for me, too! You’re making wonderful memories, Kc. I think that grandparents and seniors who help at school are special to the children. Sounds like you had a busy month before Thanksgiving! It was a busy but very fun month! We do get some great high school students helping out. In California you are required to have a certain number of volunteer hours in order to graduate. How cool is that? All of the high school students who worked Movie Night had been students at Santiago a few years ago! They not only enjoyed volunteering they enjoyed coming back to their school. Wow — so many cool activities! It’s so great that you are able to participate in the goings on at Amara’s school. That Lane Hawk sounds interesting — much needed in the grocery stores! I’m sure Amara had great fun at all the activities — and thrilled that her grandma could be there too! I am lucky that Amara’s school and PTA encourages volunteers of all ages. I think being around the younger Moms helps keep me young, too! Wow! No wonder you’ve been too busy to post. What fabulous fun you’ve been making and enjoying. I’m delighted Amara’s first dance was fun! They can be so fraught with drama… as the kids get older, of course. Now it’s just a great time with friends. Very cool! Amara must be so proud of her daddy! A pretty awesome guy to share his smarts and techy ways with the kids. Wonderful stuff here, Grandma Kc!! Thank you for sharing the incredible activity that fills your days (and heart, I’m sure!!). Amara was very nervous about the dance but Jenna did her best to calm her. Once she got with her girls she was fine! Like you said, it won’t always be this easy. Jenna said she thought a lot of Amara’s friends were glad Jenna was chaperoning — a familiar face and a cool Mom they knew. How did she get to be in the 6th grade? Some retired women get very bored. I don’t have time to get bored! I’m having too much fun. I wish we lived closer, too! If you lived closer to us than you could have helped with the Science Fair! For anyone reading this April is my cousin and her daughter home schools her 2 sons. April is their Friday Science Teacher! School would have put you to work! What a fun November you’ve had!! 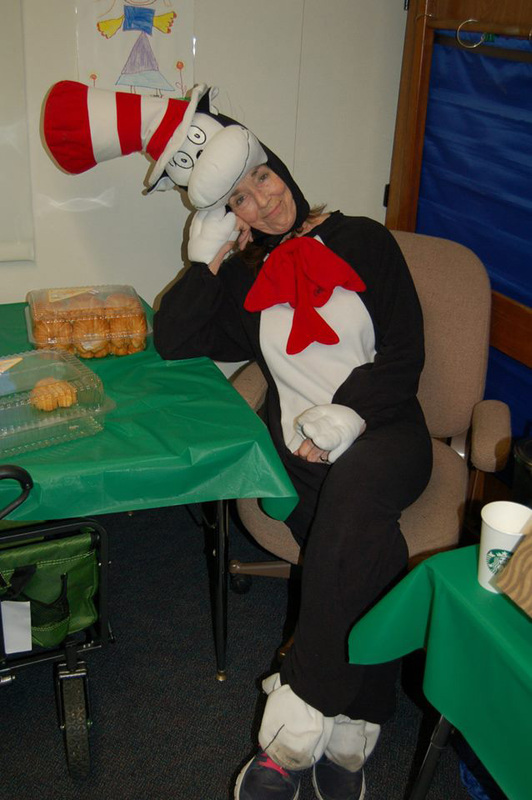 The story of the little boy telling his mom about the Cat in the Hat – and that it was the best day of the year – was precious! I’m so glad you are so involved in Amara’s school. It’s obvious that you love it as much as the kids love you! You are definitely making up for the times you missed with Jenna was in school. It doesn’t get much better than that! 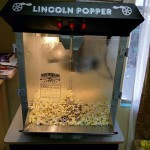 And let me just say this – that popcorn machine is AWESOME! You know your little sister is a popcorn fiend. I could eat it every night!!! The perfect snack for the kids to buy after school! Keep the good memories coming! Can’t wait to see what you guys are up to in December! Hugs from your baby sister!! Not only am I getting to make up for the fun I missed when Jenna was growing up — I get to do it with Jenna! Twice the rewards! You would certainly love the fresh hot popcorn out of that machine! Amara’s teacher from last year is pregnant and told us she is having popcorn pregnancy cravings so like you she is thrilled with this idea! Hugs from your big sister!! 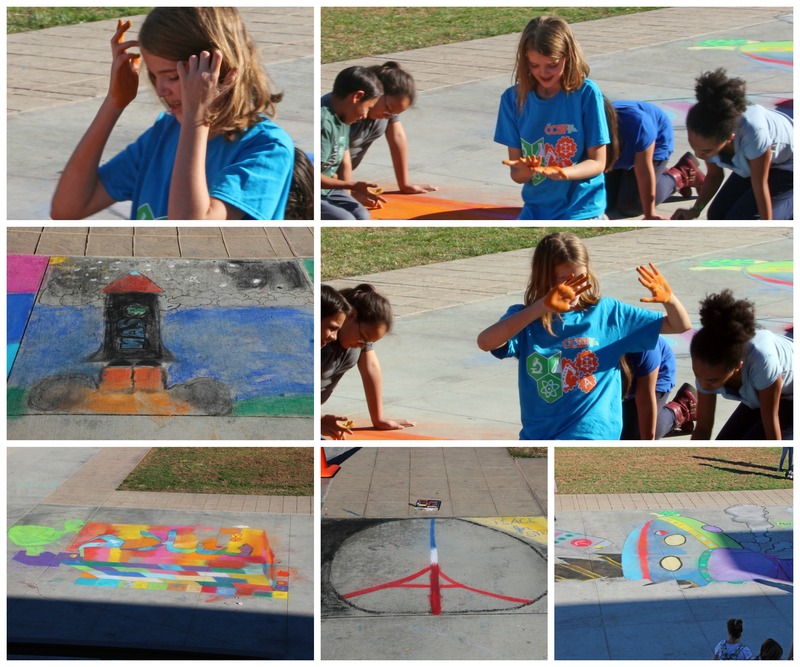 You do have such an awesome school with so many fun activities. I love the theme, how appropriate for the kids! You are such a dedicated and busy person. Amara and all of the children in the school are so blessed to have you. I had a teacher adamantly tell me that our school wouldn’t be any better than any other school if it weren’t for the strong parent involvement. I really do feel lucky to be able to be involved – to be close by, to be in good health and to be wanted! SO much fun to get hugged by so many students!